Free Ocean Princess Slot | Second Highest Payout Slots Machine Online!!! If you’re a fan of classic slot games, you will find Playtech’s Ocean Princess slot quite enjoyable. 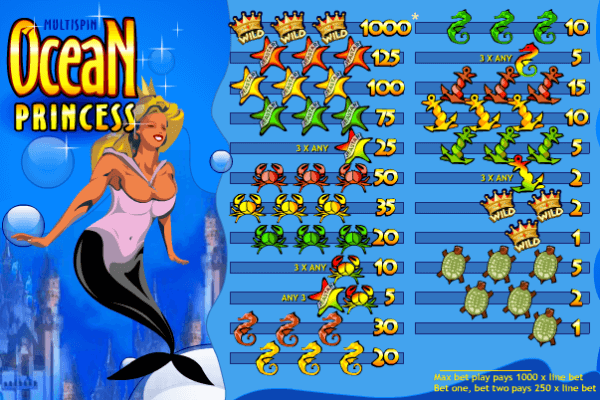 The attractive mermaid princess is ruling the ocean and your winnings, while underwater creatures such as seahorses, turtles and crabs keep her company. However, don’t expect glamorous graphics and exquisite illustrations. This game heavily relies on its features and extraordinary payouts, rather than aesthetic appeal. The special feature here is that you can choose to hold certain symbols and then respin on multiple lines. Pretty similar to multi hand Video Poker. Playtech launched five slots of this kind, Ugga Bugga, Tropic Reels, Triple Profits, Goblins Cave and of course Ocean Princess. These slots are very popular due to the control the player has over the gameplay and of course the highest payouts you can find, 99.07% RTP. Even though Ocean Princess won’t strike you as an extremely beautiful game, it does have that old-fashioned appeal that will make you feel like you are standing in an 80’s casino and playing on a land-based slot machine. Symbols include turtles, anchors, seahorses, crabs, starfish and crowns that serve as Wilds. This multispin game gives you the opportunity to set all 3 reels in motion independently with one spin. This theoretically means you can score the same symbol in each of those. Other winning combinations are listed in the paytable and are based on the number of specific symbols that appear on the board. When it comes to the amount of money you can bet, this game will sit nicely with the high rollers considering the maximum bet is £125. It’s worth mentioning that Ocean Princess has the expected RTP of 99.07%, which is one of the highest you can find, #2 on our list of best playtech slots to be exact. Ocean Princess does lack the flair and bonus features that some other slots have, but that doesn’t mean that it lacks excitement. In fact, players have the possibility of earning the jackpot of 1,000 coins, which is quite impressive for an online slot game. The Golden Crowns that act as Wilds pay either 250x line bet in a regular game, or whopping 1,000 x line bet if you play for max bet. With its classic visuals and poor graphics, Ocean Princess slot will not appeal to everyone’s taste. However, what the game lacks in visual appeal, it compensates in gameplay features. The 5×3 board makes every spin all the more interesting, while the multiple winning combinations and incredibly high RTP, definitely sound inviting and promise good fun.